The Swinging Atwood's Machine Model is an extension of the traditional Atwood's machine where one hanging mass is allowed to swing like a pendulum. One assumes that all motions for the swinging mass are possible including positions above the second peg which requires that the string remains rigid at all times. 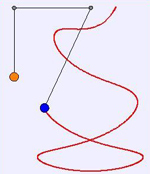 Unlike the traditional Atwood's machine, orbits or cycles are possible. In other words, for certain conditions, the motion of the Atwood's machine can continue indefinitely. In changing the ratio of the two masses and the initial angle of displacement, the trajectory of the swinging mass changes. The object of this simulation is to model that system and allow the user a large amount of control over initial conditions so that they may fully explore the system. The Swinging Atwood's Machine Model was created using the Easy Java Simulations (EJS) modeling tool. It is distributed as a ready-to-run (compiled) Java archive. Double clicking the ejs_comp_phys_swinging_atwoods.jar file will run the program if Java is installed. Please note that this resource requires at least version 1.5 of Java (JRE). Physics 200 computational poster presented during the 2011 Davidson College student research symposium. Physics 335 (advanced laboratory) experimental poster presented during the 2011 Davidson College student research symposium. The Frictional Swinging Atwood's Machine Model simulates an extension of the Swinging Atwood's machine which adds radial friction. One assumes that all motions for the swining mass are possible including positions above the second peg which requires that the string … The Frictional Swinging Atwood's Machine Model simulates an extension of the Swinging Atwood's machine which adds radial friction. One assumes that all motions for the swining mass are possible including positions above the second peg which requires that the string remains rigid at all times. The object of this simulation is to model the real (experimental) swinging Atwood's machine that was constructed for PHY 200: Advanced Laboratory at Davidson College. This system exhibits the most friction in the radial direction. In other words, the most friction occurs when the string length over one or the other pegs changes. These files are from an advanced laboratory experiment for the swinging Atwood's machine from the Spring semester 2011 Advanced Laboratory class at Davidson College. The videos were analyzed using the Tracker Video Analysis and Modeling Tool which is freely available … These files are from an advanced laboratory experiment for the swinging Atwood's machine from the Spring semester 2011 Advanced Laboratory class at Davidson College. The videos were analyzed using the Tracker Video Analysis and Modeling Tool which is freely available on the OSP Collection on ComPADRE. One can either view the video file (the wmv file) alone using a video playback program, or within Tracker using the tracker file (the trk file). This particular video shows a transient behavior before the swinging Atwood's machine "settles down" into a more periodic motion. The videos were analyzed using the Tracker Video Analysis and Modeling Tool which is freely available on the OSP Collection on ComPADRE. One can either view the video file (the wmv file) alone using a video playback program, or within Tracker using the tracker file (the trk file). This particular video shows the gradual damping of the motion of the swinging mass of the swinging Atwood's machine. This motion can also be simulated using the Frictional Swinging Atwood's Machine Model. Source Code for the Swinging Atwood's Machine Model program. Rights: This material is released under the GNU General Public License Version 3. L. Ruckle, Computer Program SWINGING ATWOOD'S MACHINE MODEL (2011), WWW Document, (https://www.compadre.org/Repository/document/ServeFile.cfm?ID=11247&DocID=2290). L. Ruckle, Computer Program SWINGING ATWOOD'S MACHINE MODEL (2011), <https://www.compadre.org/Repository/document/ServeFile.cfm?ID=11247&DocID=2290>. Ruckle, Leah. "Swinging Atwood's Machine Model." https://www.compadre.org/Repository/document/ServeFile.cfm?ID=11247&DocID=2290 (accessed 25 April 2019). Ruckle, Leah. Swinging Atwood's Machine Model. Computer software. 2011. Java (JRE) 1.5. 25 Apr. 2019 <https://www.compadre.org/Repository/document/ServeFile.cfm?ID=11247&DocID=2290>. This resource is stored in 4 shared folders. The Easy Java Simulations Modeling and Authoring Tool is needed to explore the computational model used in the Swinging Atwood's Machine Model.